NARPRO Member Dave Martin of Martin’s Auto Repair will be at the Knight and Swift Transportation Touch A Truck Family Event & Fundraiser on February 9th! 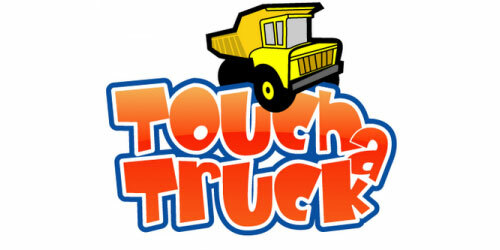 Bring your family to explore and touch more than 40 different vehicles and trucks. Kids of all ages will be able to climb up and get inside all sorts a different vehicles! We will have everything from Firetrucks, Police, Helicopters, Race Cars, Military Vehicles, and more! Food, face painting, local vendors and activities for the kids! Be sure to stop by the Martin’s Auto Repair/NARPRO booth where there will be a MatchBox race track for kids AND enter our raffle for a chance to WIN a FREE FIRE HD TABLET! This fundraising event is designed to assist children affected by Spina Bifida by granting them the opportunity to attend a specialized camp, called Camp Patrick. All proceeds will go to fund Camp Patrick which is a free camp for kids with Spina Bifida. Please see The Patsy Reeve Foundation and Camp Patrick Foundation for more information. 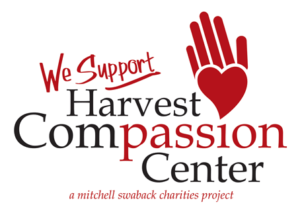 Harvest Compassion Center is our latest community partner. The HCC is so much more than a food bank, it’s a one-stop shop! It is set up like a mini-mart and clothing boutique, where guests are welcomed to shop and choose their desired food items, hygiene products, baby items, various home products and clothing FREE of charge. The Harvest Compassion Centers are open to the general public and provide service to anyone living in Arizona, as there are no pre-qualifications or appointments ever needed. In every NARPRO shop, you’ll find a drop-off location for food, clothing, and household items. To learn more about what items are always needed, click here. This past Mother’s Day, we had the privilege of partnering with Helping Hands for Single Moms at a Mother’s Day brunch they hosted. This event celebrated moms, our heros, and the love and sacrifices they make for their families on a daily basis. Brenda Warner, mother of 7, author, speaker and wife of Hall of Fame Quarterback Kurt Warner was the inspiring guest speaker. All of the moms in attendance received gifts, but 3 amazing moms were given the surprise gift of a lifetime! 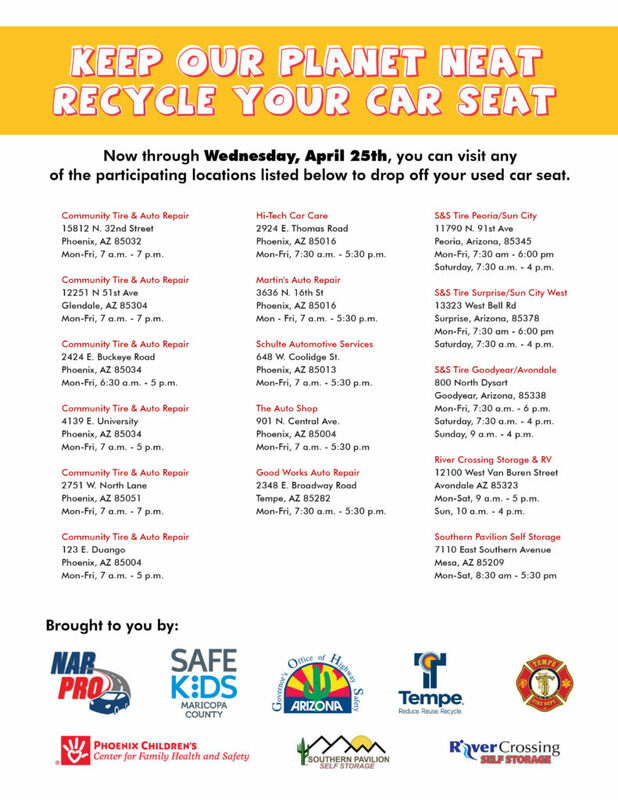 NARPRO is partnering with Safe Kids Maricopa County, City of Tempe and other local organizations to collect old, expired, and damaged car seats, which volunteers will take apart for proper recycling. Car seats don’t last forever, and over time their components will break down, especially in the hot Arizona sun. Older car seats or those that have been involved in an accident, may not have visible damage showing, but they should not be used. This annual event helps those with older, expired, or damaged car seats get rid of them in an environmentally-friendly way, by keeping them out of vehicles and landfills. Last year, nearly 1000 car seats were saved from unsafe use and dumping. Residents can drop off their car seats that need to be recycled at one of our participating NARPRO shops from now until April 25th, 2018. We will be recycling them on April 28th during the Tempe Zero Waste Day, held at the Tempe Fire Training Facility, 1340 E. University Drive. First, we want to say, “Happy Holidays!” to you and your loved ones from all of us here at NARPRO. As we reflect, we simply could not have asked for a better year! 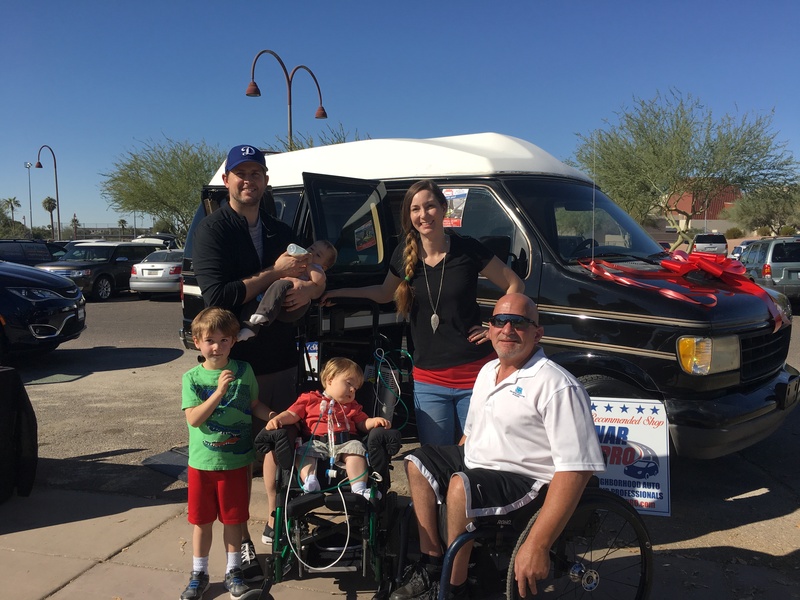 In 2017, we were honored to provide several cars to a few deserving, single Moms, gave a Wheelchair Accessible Van to the Lefebvre family who have two young sons affected with Spina Bifida, provided expertise on child car seat safety at the Safe Kids Maricopa County 22nd Annual Car Seat Event, provided goodies and advice at the Local First Fall Festival, recycled 100s of used child car seats, and participated in many more events in our communities. We also gave out countless Auto Repair gift cards to your family and friends. It has been a busy, blessed, and fulfilling year and we are thankful to all of you for allowing us to be such an important part of your communities. 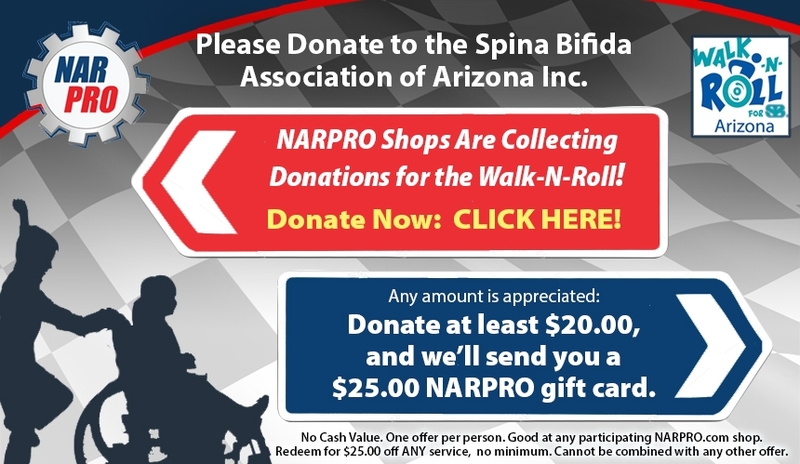 On November 18th, NARPRO once again had the privilege of teaming up with Walk-n-Roll for Spina Bifida, for another inspiring event. 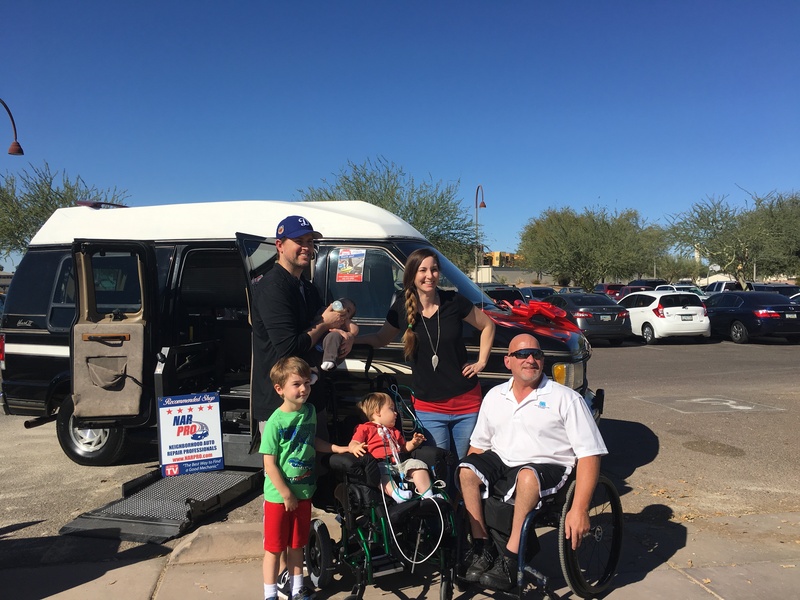 During the event, held at Steele Indian School Park in Phoenix, Narpro, gave away a refurbished 1995 E150 Econoline Cargo Wheelchair Accessible Van to the Lefebvre family, who have two young sons affected with Spina Bifida. They were such an inspiration to us and continue to be an inspiration to other families affected with Spina Bifida. The boys love to be outside, visit the aquarium, get ice cream cones and bring meals to people in need. Having a wheelchair accessible van, means that physical impairments won’t steal the childhood wonder away from these very special boys. They can comfortably go out on family outings, without allotting an extra hour of time to get everyone into the car. It also means that going to the dozens of doctor appointments and hospital visits will also be much easier and safer. 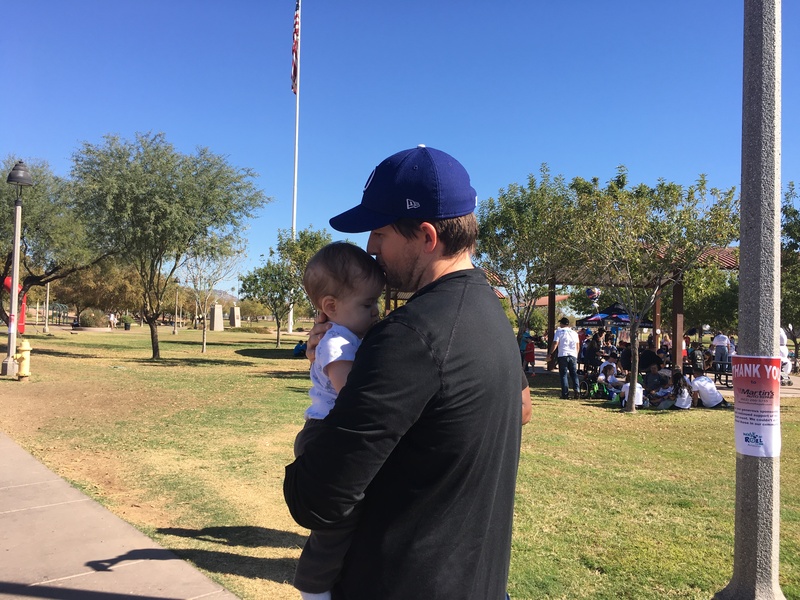 We were at the Arizona Fall Festival over the weekend, and had such a fabulous time meeting and mingling with thousands of local residents – it is such a fun event to be a part of! 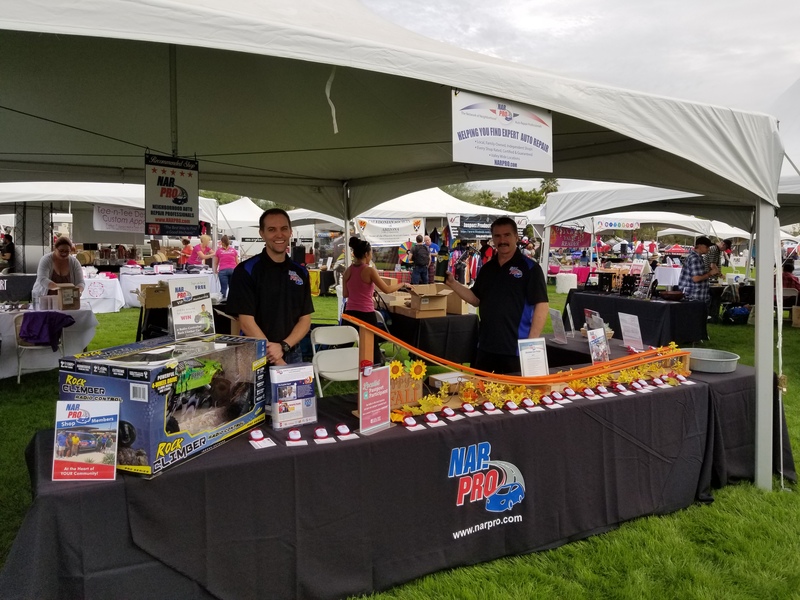 We not only have the opportunity to show off our Arizona pride and help raise funds for Local First Arizona, but we also are able to spread awareness about NARPRO and how we are doing our part to help local residents find honest and reliable auto repair shops! NARPRO, a group of local small business auto repair shops who are devoted to quality service and giving back donated a car (2002 Ford Focus) to a single mom who is a part of the nonprofit, Helping Hands for Single Moms. NARPRO acquired the car through Valley Towing, who have helped them with car donations in the past. NARPRO has been providing free car repair services to this group and their moms for a decade now. The car Chastity was driving was completely wrecked recently and she was desperate for reliable transportation for her daughter and son and to get to school/work. 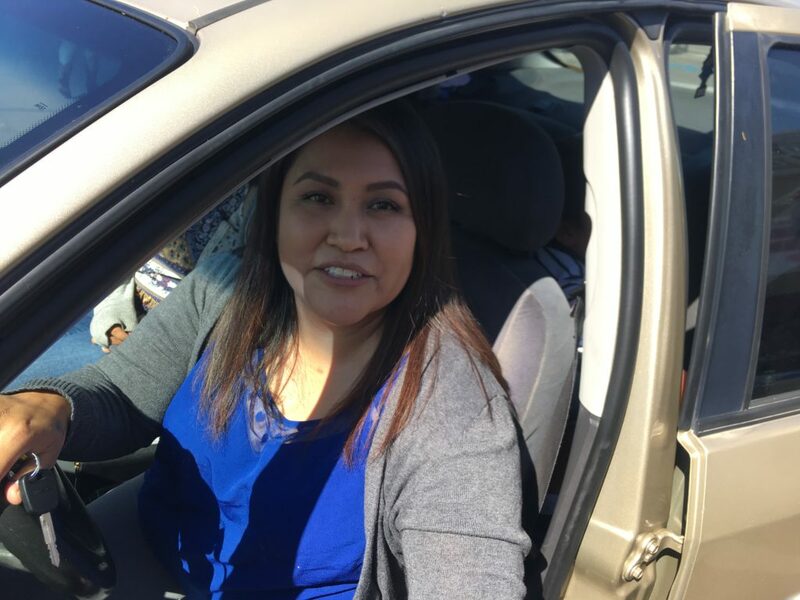 The group of mechanics at NARPRO and Valley Towing were proud to be able to get Chastity back on the road and onto her goal of being a nurse at Indian Health Services in Phoenix. To read the thank you letter from Chastity, please click here. NARPRO is dedicated to helping our local communities! As the premier collection of trusted local auto repair shops in the Phoenix, AZ area, we know that we have a duty to help our wonderful local communities thrive. Our network of automotive professionals are very active in each of their neighborhoods, participating in events, fundraisers, donations and more! We are always looking for more ways to get involved, so feel free to contact us today about any great events in the community, or check out our current community involvement below. On Friday, September 29th at 6:00 in the Omni Scottsdale Resort and Spa in Montelucia, Eddie Johnson & Friends is hosting a unique and fun-filled event celebrating women who have done extraordinary things! This will be an engaging, high energy, action-oriented event that will provide attendees an inside view of professional athletes. Event proceeds will benefit Helping Hands for Single Moms. This local non-profit assists low-income single mom families while the mothers pursue a college degree and financial independence. Helping Hands for Single Moms has helped hundreds of single mom families since 2002. The Walk-N-Roll for Spina Bifida will be hosting an event November 5th, 2016. Any amount is appreciated! Donate at least $20.00, and we’ll send you a $25.00 NARPRO gift card to be used at any participating NARPRO shop. 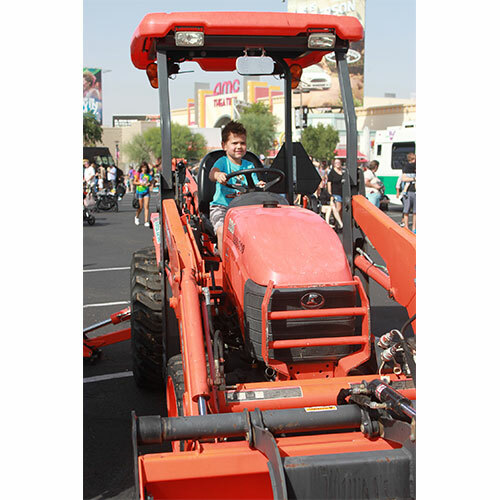 The Certified Local Fall Festival is an annual celebration of all things local to Arizona. 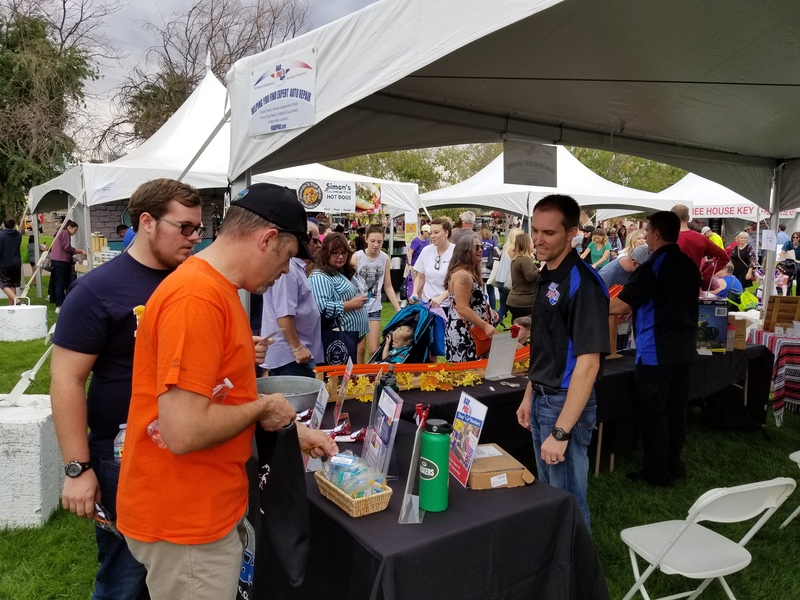 The festival features 100+ vendors with some of Arizona’s favorite local businesses, food samples from some of the best Arizona restaurants and food trucks, and a beverage garden. Local business vendors will be selling a variety of unique gifts and products, prices vary. Attendees will also be able to purchase raffle tickets and bid on silent auction items on site. Join NARPRO September 24th for the 3rd Annual “My Mom My Hero” Fundraiser Event. 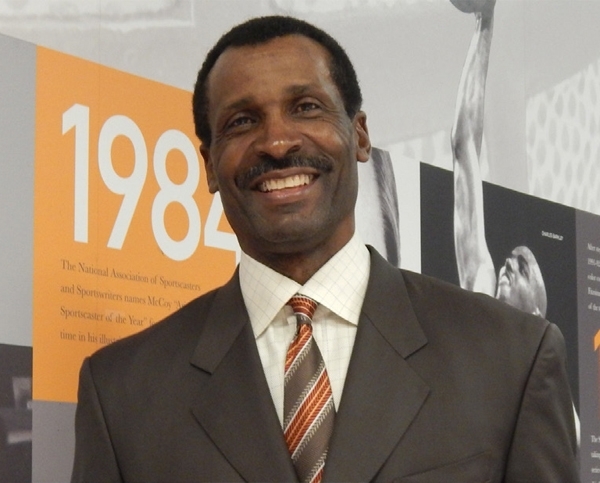 Eddie Johnson & Friends presents an event that will provide attendees an inside view of professional athletes. The proceeds will benefit Helping Hands for Single Mothers, a local non-profit that assists low-income single mothers and their families while the mothers pursue college degrees and financial independence. Helping Hands has helped hundreds of single mothers and their families since 2002 and continues to make a difference in the community. NARPRO’s Good Works Auto Repair Partners with The Surprise Squad to make a HUGE Difference! Once again a NARPRO member made headlines – and a local woman’s day – with a car give away. Good Works Auto Repair provided the car (through a very generous donation from Glen’s mother) and all the inspections to make sure it is safe and reliable and Helping Hands for Single Moms provided the connection to Shauna, an exceptionally hardworking, dedicated mother of two beautiful children. We’ve never met anyone quite so determined and deserving of a little help from her friends. Congratulations for all you’ve accomplished, Shauna, and we wish you lots of happy miles in your new car! 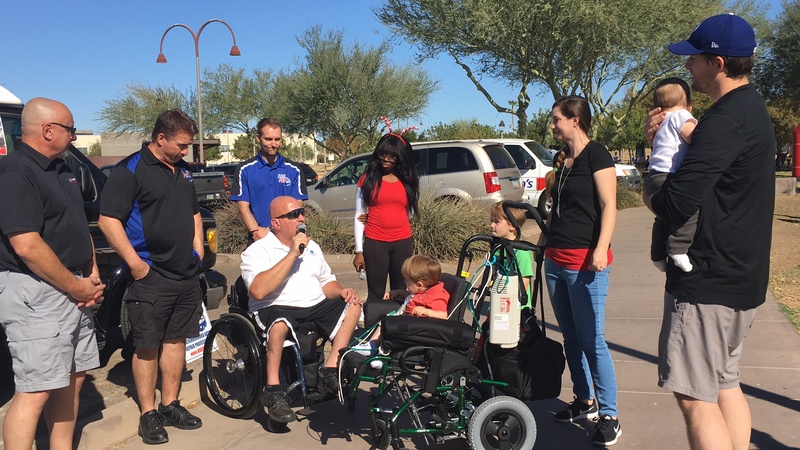 NARPRO Member, Community Tire Pros Teams up with Arizona’s Family The Surprise Squad! With help from 3TV’s Arizona’s Family The Surprise Squad, Community Tire Pros surprised a valley mother with FREE auto repair! 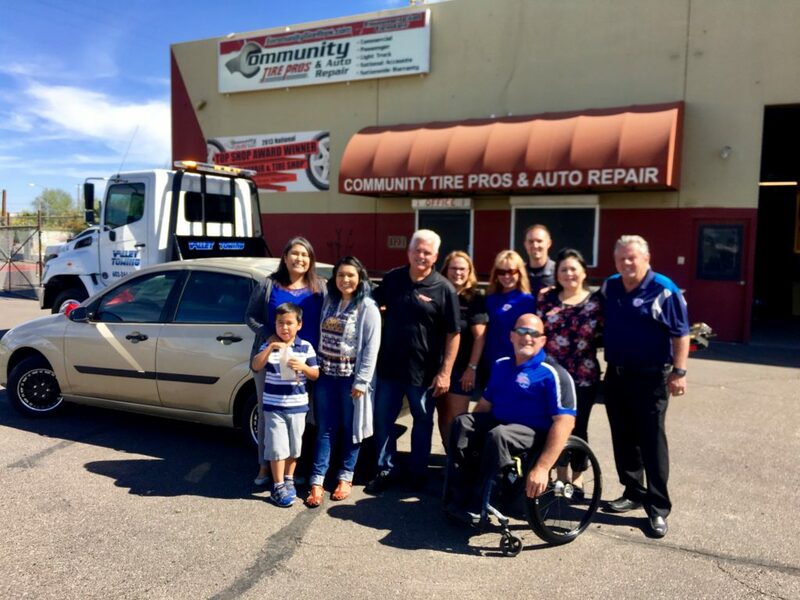 Community Tire Pros provided front and rear brake replacement, new struts and shocks, two new tires and repaired the vehicle’s air conditioning – but they didn’t stop there! Among many other repairs to Rosemary’s vehicle, Community Tire Pros presented her with a $200 Gift Certificate for car detail at Los Olivos Car Wash.
Help keep our planet neat by recycling your car seat on Friday, April 22nd – from 8am until noon – at the Phoenix Fire Station on Baseline and 42nd Pl. in Phoenix. Cant make it out on the 22nd? You can drop off your car seat at any of the participating drop-off locations from April 11th through the 18th. From Goodyear to Mesa, certified child passenger safety technicians will work one-on-one with families to educate and offer peace of mind during the Safe Kids Maricopa County (SKMC) 21st annual Car Seat Event on Feb. 27th. According to the Maricopa County Department of Public Health, car seats are used incorrectly up to 90 percent of the time. According to the Arizona Department of Transportation, children 14 and younger accounted for 44 fatalities and 3,631 injuries in motor vehicle crashes in 2012. Congratulations to Tysa, our winner for the Helping Hands For Single Moms August Car Give Away! NARPRO and Helping Hands for Single Moms – a scholarship program that helps low income, single moms obtain their college degree – were delighted to present Tysa with a “brand new”, fully restored 1999 Dodge Caravan during the month of August! Thank you to all who entered and a special Congratulation to Tysa!! Enjoy your new Caravan! In honor of Brake Safety Awarness Month, NARPRO is giving away free brake pads! August is Brake Safety Awareness Month and some participating NARPRO shops are giving customers FREE Brake Pads (valued at up to $80) when they schedule a brake inspection between Aug 1st – Aug 31st – just pay for labor and any other necessary parts! In addition to getting your brake pads for free, 10% of the proceeds from your brake service will be donated to Breast Cancer Vaccine Research. Click Here to learn more and to schedule your brake inspection. Great Gifts for Dads & Grads! NARPRO is offering a unique gift idea for the dad or grad in your life. This Father’s Day, save dad time and money on his vehicle care by giving him a free standard oil change and filter. Or, for that special graduation gift, give your grad the gift of peace of mind when they know they can rely on a quality, local repair shop near their work or home. Sign the special person in your life up for a free VIP Card Click Here and enter DAD or GRAD in promo code and we’ll send them a card for a FREE oil change too. Up to 5 quarts of conventional oil, plus filter. Valued at $35. Card can also be used to take $35 off a synthetic or larger quantity oil service, taxes and additional fees not included. No expiration date on card. Sign up to get free oil change NOW until June 21, 2015. New Customers Only. As we move toward the holidays we can’t help but to be thankful for our families and our blessings. Some families won’t be together this holiday season, as our nation still has men and women in the armed forces serving overseas. Through the rest of November and the entire month of December, we will be supporting our troops through the Packages From Home program. In order to participate, simply print out the coupon below and bring it in to any of our NARPRO shops along with one or more of the ten items listed. Not only will you be helping out our active military personnel overseas, but you will also receive 10% OFF LABOR for ANY Auto Repair Service. Please PRINT the coupon below and bring to it any local NARPRO shop for your discount. Brakes for Breasts – Free Brake Pads in October! Do you need new brake pads in your car? Would you like those brake pads for FREE? Would you also like to help breast cancer research in the process? Then this October, stop by any of the participating NARPRO auto repair shops in Phoenix! We are partnering with Brakes for Breasts to help raise money for the Cleveland Breast Cancer Vaccine Research Fund by performing free brake inspections and installing free brake pads (valued up to $80)! 1.Click Here to find your local NARPRO shop and request to schedule your free brake inspection between October 1-31, 2014. 2. Your participating Brakes for Breasts Auto Shop will provide FREE brake pads (valued up to $80) to you during the month of October. You pay for labor and other necessary parts. 3. Your participating Brakes for Breasts Auto Shop will donate 10% of your service repair costs directly to the Breast Cancer Vaccine Fund. Help us to reach Arizona’s goal of $50,000! Watch these videos to learn more about the Breast Cancer Vaccine as well as an incredible look at worn out car brakes. If you don’t need brake services but would like to make a donation towards this great cause, Click Here to be connected directly to the Cleveland Clinic’s giving page.